Located on Upper Cheyne Row, one of London’s most sought after addresses, sits a former architect’s studio turned c.7,000 sq. ft. super-home. Discreetly tucked away behind a sleek minimalist front exterior, the residence is entered through the main corridor onto a jaw-dropping 2,000 sq. 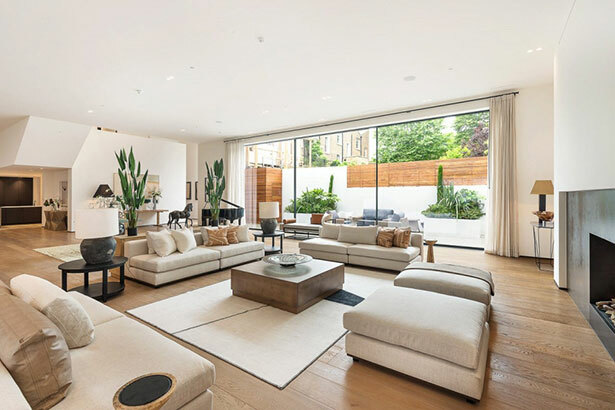 ft. reception room characterised by 4m high ceilings, floor-to-ceiling windows and large glazed sliding doors opening onto an abundance of outside space. On the market for £22 million with leading estate agents Russell Simpson and Knight Frank, the four-storey home also comprises five bedrooms – one of which is a master bedroom suite complete with stairs onto a private study and roof terrace – kitchen/breakfast room, TV room, family room, gymnasium and fitness studio, patio gardens on the ground floors, as well as secured off-street parking for two cars. Occupying land once part of the adjacent Our Most Holy Redeemer & St. Thomas More Church (built in the 1800s) the home retains elements of the church’s former rear wing, damaged during a Second World War bombing raid. The home perfectly blends a section of the historic Grade II Listed building with crisp modern design, using full-length glazed windows. The main living quarters of the home are spaced across two floors. The reception room occupies the majority of the ground floor, complete with access to the East Garden and quaint patio garden. Leading on from the reception room is an open-plan kitchen complete with Miele appliances, breakfast bar and full-length glazed windows opening onto an outdoor courtyard flanked by the historic stone wall.